Thank you for purchasing our Theme, We are so happy that you choosed Munza for your website. Please do not forget to rate the Theme and We'll be waiting for your Feedback. It would be nice to see your comments on our product, this documentation consists of several parts and shows you how to set up and administrate your WordPress site. We did our best to make this documentation as clear as possible. However, if you have any difficulties with the our theme or any suggestions on improving the theme or the documentation, feel free to contact us via our support link: support@it-rays.net. What is a WordPress Theme ? Munza WordPress Theme requires some basic settings to work properly with no issues, and this is somehow different from many other minimal wordpress themes as it includes tons of features and options to make it easy for you to make your website as you dream with. 1. Login to your ThemeForest account and go to the "Downloads" tab. 2. Find Munza Theme, then click Download button. You will find "All Files & Documentation" or "Installable WordPress File Only". The style.css is for the main styling, this file also contains some general styling, such as blog styling, headers, footers, page titles, etc. Keep in mind, that these values might be overridden somewhere else in the file. Ex: If you would like to edit a specific section of the site, simply find the appropriate label in the CSS file, and then scroll down until you find the appropriate style that needs to be edited. this is the contents of css folder inside the theme folder. assets/css/plugins All Assets needed for bbpress and buddypress plugins. assets/css/style.css This file contains all the necessary styling rules for the theme. rtl.css RTL right to left support. assets/js/vendor This folder contains all the jquery plugins included in the theme. assets/js/script.js Responsible For The Main Custom jQuery Function In The Whole Site. Munza comes with 6 months of included support and free lifetime updates for your theme. Once the 6 months of included support is up, you have the opportunity to extend support coverage up to 6 or 12 months further. If you choose to not extend your support, you will still be able to submit item comments and also still have access to our online documentation and theme updates. After downloading the ZIP file from ThemeForest UNIZP that file, after unzipping you see various structure of theme. Login to your wordpress dashboard, go to WordPress Appearance -> Themes section. Click on Install Themes tab. Click on Choose File button, and select .zip theme file and click Install Now button. Go to the downloaded package then select Theme/munza.zip and extract it. Follow the instruction below for activating the theme. From the Available Themes section, click on the Munza title (or Munza screenshot) to activate. A preview of the Theme will be shown. To activate the Theme click the Activate Munza link in the top right. 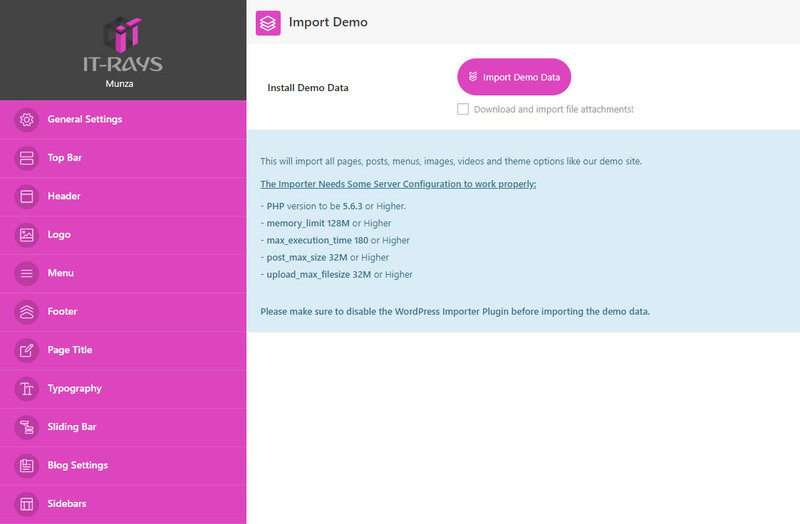 This will import EVERYTHING like our main demo content (Sliders, Portfolio Grids) Automatically. Under Appearance tab click on Munza, this will direct you to the theme options panel. In the new page appeared select the last item "WordPress"
Find the Resources folder inside the root folder of Downloaded Package File. To Import sliders, RAYS Grid Plugin content, just go to these plugins in the left side of the Administration Panel and select import/export link in each plugin then import the corresponding content for each plugin from demo-data folder. There are two ways to update Munza theme, via wordpress dhashboard or via FTP. If you want to update the theme via WordPress dashboard you need to install Envato Market Plugin that enables you to check the theme update and perform the theme updates easily just with easy steps, Just follow the steps they mention and all will be done. Another easy way to update Munza theme is to download and install Easy Theme and Plugin Upgrades and follow the steps that are also very easy to perform the theme and also plugins upgrade. Important Note : It is Very Important to make a backup of your theme folder and plugins folder. Also It’s very important to delete (not to replace) the old Munza theme folder and Munza Core plugin folders. They need deleted because if you only replace the folders, then the old files can be left on the server and the update may not work. Download the theme from themeforest as descibed above. Log into your server using FTP and go to wp-content > themes > then you will see Munza folder. Backup the ‘Munza’ theme folder by downloading it to your computer, then delete it. please note that any customizations to the theme's core files, such as PHP files will be lost unless you're using a child theme. Now we need the theme files you’ve just downloaded. If you’ve downloaded the installable WordPress file, then you only need to extract it, but If you’ve downloaded the Full Package you must extract it then open Theme > extract the Munza.zip file to get to the Munza folder. Now you can drag and drop the new Munza theme folder into wp-content > themes folder location. Make sure the folder is named Munza. There are two ways to update Plugins, via wordpress dhashboard or via FTP. As described above you can download and install Easy Theme and Plugin Upgrades and follow the steps that are also very easy to perform the plugins upgrade. Important Note : It is Very Important to make a backup of your plugins folder. Also It’s very important to delete (not to replace) the old plugin folders. They need deleted because if you only replace the folders, then the old files can be left on the server and the update may not work. Download the Full Package from themeforest as descibed above. Log into your server using FTP and go to wp-content > plugins > then you will see plugins folders. Backup the plugin folder you need to update by downloading it to your computer, then delete it. Now we need the full package you’ve just downloaded. you need to extract it then open Resources Folder > wp-plugins > extract the plugin zip file to get to it's folder. Now you can drag and drop the new plugin folder into wp-content > plugins folder location. Make sure the folder is named with the plugin name(Ex: Munza-core). Now Let's discuss each element in our powerfull theme options panel individually to make use of all theme features. Save Changes & Restore Defaults Buttons on the top right of the page. Save Changes: After selecting your options from the theme options panel click this button to save the changes. Restore Defaults: When you click this button, a message will appear to you, choose OK and hit the save changes button to reset the theme options to their default values or cancel this action by clicking on cancel button. Choose layout: Choose the Wide or Boxed Layout of your site. Site Width: if not responsive layout type here the main container width in (%), and this will apply the fixed layout. Sidebar Width: the page sidebar width in (%). Content Padding: Top and Bottom main content padding in px. Tags Limit: Control the Number of tags that will be displayed in tags widgets. Back To Top Button: Show the back to top button at the bottom of the page when scrolling down. Smooth Scrolling: Enable / Disable the mouse wheel smooth scrolling while navigating the site. Image Placeholders: Show default image for posts that not having featured image. Page Pre-loader Enable / disable Page loader. Body Background color: Body background color for page loader only. Pre-loader Style: Select a preloading style from 3 available ones ( Or Upload a custom loading image ) that appears before page completely loaded. Animated Bar color: Animated bar forecolor. Bar Background color: Animated bar background color. Loading Text: Enter text that shows below the loading bar. Loading Text Color: color for the loading text below the loading bar. Main Site color: Select the main theme color that will be applied on all elements of your site. Body Font color: Choose your new custom body font (text) color from the color picker. Body Links color: Choose new custom color for all site links from the color picker. Body Background color: Choose your new body custom background color from the color picker. Body Background Image: Select an image to use for the body background image. Background repeat: choose if the background will repeat horizontally or vertically or both or no repeat at all. Background Position: This option lets you choose if the background position inside the body. Background Size: This option lets you choose if the background will fit the container width and height or not. Fixed Background: if enabled the body background image will be fixed with page scroll down. Background color: Body background color for 404 error page only. Disable Default background image: disable the default background for 404 page that is set by the theme CSS. Header Links color: Custom color for header links. Header Icons color: Custom color for header icons. Header Hover color: Custom hover color for header links. Header Background color: Choose new custom color for 404 page header. Custom Logo: upload a custom logo for 404 error page only. These settings let you Show / Hide top bar and also choose what to show on the left and right sides of the top bar on your site. Show top bar: Show/Hide top bar above header. Menu: Displays one of your menus on left side. Text: Adds whatever text you want that will appear on left side. Link: Adds Link with icon that will appear on left side. Social Icons: Displays social icons with links to your social media pages on left side. Search: Adds Search Box on left side. WP Login: Displays a login / register links and welcome to guest on left side. Shopping Cart: Adds shopping cart on left side. Language Switcher (WPML): WPML language switcher menu enables user to choose his prefered language. Menu: Displays one of your menus on right side. Text: Adds whatever text you want that will appear on right side. Link: Adds Link with icon that will appear on right side. Social Icons: Displays social icons with links to your social media pages on right side. Search: Adds Search Box on right side. WP Login: Displays a login / register links and welcome to guest on right side. Shopping Cart: Adds shopping cart on right side. Color: Choose your prefered top bar color. Full Width: Make top bar in full width. Bottom Border: Add bottom border for top bar. Border color: Custom color for top bar bottom border. Hide On Small Screens Hides the top bar only when the screen is larger than 768px and smaller than 1024px. These settings let you choose the header options on your site. Choose header layout: Choose header layout from the 4 available styles. Full Width: Make the header full width not wrapped center in the page. Fixed: Make the header with fixed position over the page content. Show Search Box: Choose to show / hide the search box beside top menu. Show Cart Box: Choose to show / hide the cart box beside top menu. Show Social Icons ? This will show social icons in the left and right side headers. Left & Right Side Copyrights ? This will only apply the copyrights in the left and right side headers. Copyrights Text Text for the left, right side headers copyright. These settings let you choose the header styling on your site. Header Height: enter header height in pixels. Header Padding: Left and Right header padding only. Text Color: Choose header links color from the color picker. Links Hover color: Choose header links hover color from the color picker. Icons color: Choose header icons color from the color picker. Background color: Choose your new custom background color from the color picker. Border Top color: Choose top header border color from the color picker. Border Bottom color: Choose bottom header border color from the color picker. Background Image: Select an image from the uploader or insert an image url to use for the header background image. Background repeat: This option lets you choose if the background will repeat horizontally or vertically or both or no repeat at all. Enable Sticky Header: Lets you choose Enable / Disable Sticky header. Font Color: Choose custom links color from the color picker. Hover Color: Choose custom links hover color from the color picker. Show on Small Screens: Enable / Disable the sticky header on Small Screens. Logo Position: Choose logo position (Left - Center - Right). Logo Type: Choose your Logo to be an Image / Text. Default Logo: Upload an image for the default logo. Sticky Header Logo: Upload an image for the Sticky header logo. Retina Logo: Upload an image for retina logo (2x) dimensions. Logo Font Family: Select the logo font family in case you choose TEXT Logo. Logo Font Size: Select the logo font size in case you choose TEXT Logo. Logo Font Weight: Select the logo font weight in case you choose TEXT Logo. Logo Text Color: Select the logo text color in case you choose TEXT Logo. Mobile Logo Font Size: Select the logo font size for mobile in case you choose TEXT Logo. Tagline Font Family: Select the Tagline font family in case you choose TEXT Logo. Tagline Font Size: Select the Tagline font size in case you choose TEXT Logo. Tagline Font Weight: Select the Tagline font weight in case you choose TEXT Logo. Tagline Text Color: Select the Tagline text color in case you choose TEXT Logo. 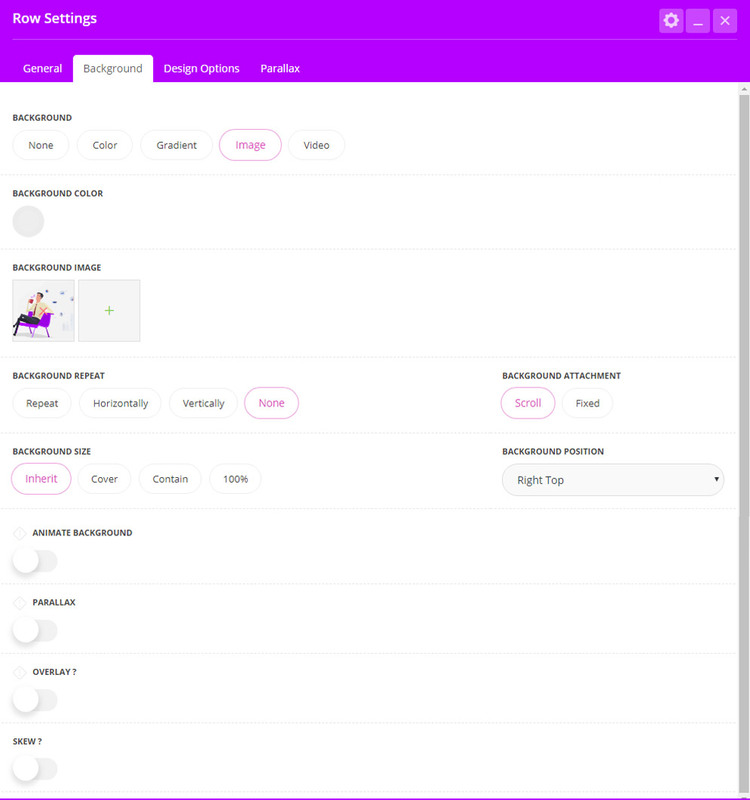 Hover Animation: Enable / Disable menu links hover animation. Menu First Level Icons: Show / Hide main menu first level icons. Show Submenu Icons: Show / Hide sub menu icons. Show Menu Subtitles: Show / Hide menu Subtitles below the menu item link. Sub Menu Color: Background color for the sub menu. Add unlimited nav menu locations. 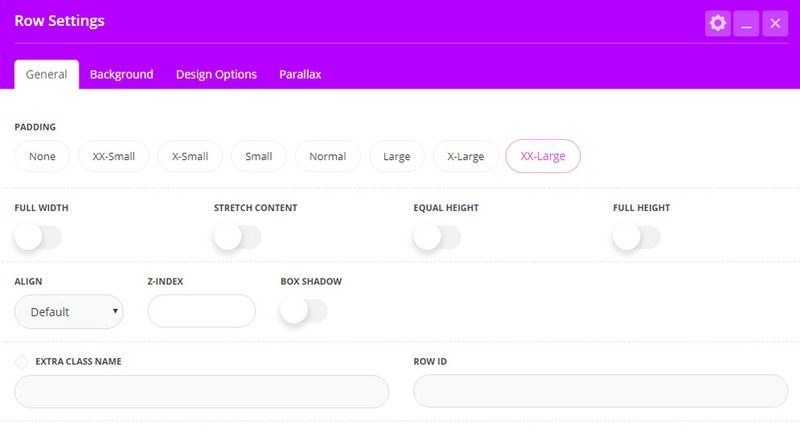 The first option is to choose the footer style from the available 5 footer styles. Footer Style: Choose footer style from 3 pre-defined styles. Footer Width: Choose footer To be wide or boxed style. Fixed ? Make bottom fixed footer. Show top footer bar Area: Show / Hide Top Footer area on your site. Heading: Enter the left text Heading for the top footer call to action. Text: Enter the left text for the top footer call to action. Button Text: Enter the button text for the top footer call to action. Show footer widgets Area: Show / Hide Footer Widgets on your site. 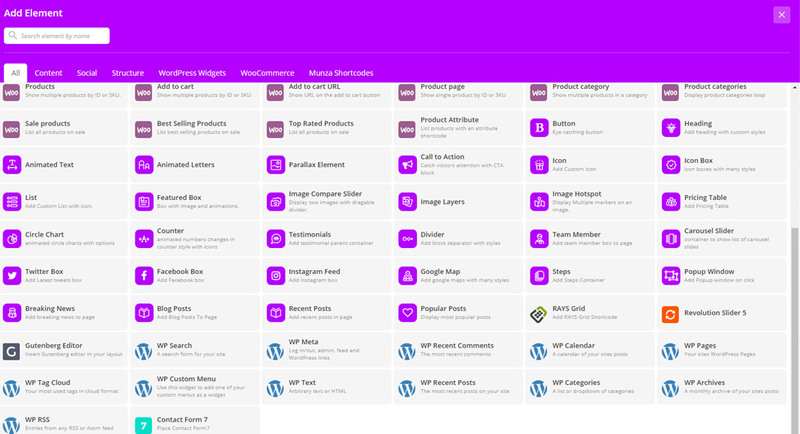 Number of Columns: The number of footer widgets columns per row. Text color: Choose Middle footer text color from the color picker. Background Image: Select an image from the uploader or insert an image url to use for the Top Footer Bar background image. Background Position: This option lets you choose the background position. Show Bottom footer Area: Show / Hide Footer Bottom Area on your site. Copyrights: Insert your site Copyrights. Style: Choose from avaiable 5 pre-defined styles. Position: Choose How the page titles will be Horizontally aligned (Left - Center - Right). Height: type the custom page title height in px. Icon: Select page title icon from the popup to be shown in the page title block. Icon Font Size: Enter page title font size in pixels. Icon color: Choose a solid Icon color. Icon Background color: Choose a solid Icon Background color. Hide All Page Titles: Show/Hide page title in all pages. Font Family: Choose Font Family for main page title. Font Size: Choose Font size for main page title. Subtitle Font Size: Choose Font size for page sub title. Font Weight: Choose Font weight for main page title. Font Color: Choose a solid color for page title. Subtitle Font Color: Choose a solid color for page sub title. Text Background Color: Choose a color for the title text background. Background Type: Can be solid color or gradient color. Background Color: Choose a color for the main title background. Gradient Color: Choose two or more colors for the main title background. Background Image: Select an image from the uploader or insert an image url to use for the page title background image. Parallax Background: if enabled the body background image will be in parallax effect with page scroll down. Overlay: This option lets you make Overlay over the background image. Show BreadCrumbs: Show / hide breadcrumbs for all pages. Style: Choose Breadcrumbs from all 4 available styles. Show on Mobiles: Show / hide breadcrumbs in mobiles. Text Color: Choose a solid color for breadcrumbs text. Background Color: Choose a color for the breadcrumbs background. The Menu typography and The Headings typography are not affected by this option because they have their own settings. Select the Menu font family from the font selector and also select font size, font weight and text style of menu items. Select the Headings font family from the font selector and also select font size, font weight and line height of all Headings elements. Show Sliding Bar: Show / Hide the sliding bar. Select Side Bar: Select the side bar for sliding bar content from all available widgets. Coulmns Per Row: Number of horizontally aligned columns per one row. Sliding Bar On Mobile: Turn on to display the sliding bar on mobiles. Icon Color: Choose the color of the button. Hover Color: Choose the hover color of the button. Icon Background color: Choose the background color of the button. Icon Border color: Choose the border color of the button. Background Top Color: Choose the top gradient color for sliding bar background. Background Bottom Color: Choose the bottom gradient color for sliding bar background. Headings Color: Choose solid color for the sliding bar heading font. Heading Font Size: Choose the sliding bar heading font size. Content Font Color: Choose solid color for the sliding bar content font color. Content Font Size: Choose the sliding bar content font size. Featured Image Size: Select what size you prefere from the pre-defined sizes. Blog Sidebar: Select how the layout will look (With right sidebar or left sidebar or witout sidebar). Read More Text: Enter the text for read more button. Pager Type: We have 3 pager types (Numeric + Navigation pager and Older Newer page or Load more pager). Pager Position: control the pager position (Left, Right and Center position). Show Media: Show / Hide post media (featured image or video or audio, etc...). Show Post Icon: Show / Hide post icon above the post media. Show Title: Show / Hide post title below the post media. Show Category: Show / Hide post categories. Show Date: Show / Hide post date before the post title. Show By Author: Show / Hide post author. Social Icons: Show / Hide social sharing icons. Show Comments: Show / Hide post comments count. Show Post Content: Show / Hide post summary. Disable Post Content Format ? this option will disable the default wordpress summary content. Max. number of words: The text length that appears in the posts list description. Single Post Sidebar: Select how the layout will look (With right sidebar or left sidebar or witout sidebar). Show media: if enabled the post details page will show the post media. Show Title: if enabled the post details page will show the title. Show Post Icon: if enabled the post details page will show the Post Icon. Show Date: if enabled the post details page will show the date. Show By Author: if enabled the post details page will show the author. Show Post Views: if enabled the post details page will show the post views. Show Like Button: if enabled the post details page will show the like button. Show Category: if enabled the post details page will show the post category. Show Post Title: if enabled the post details page will show the post title. Show Post Content: if enabled the post details page will show the post content. Show Social Icons: Show / Hide social sharing icons. Show Tags: if enabled the post details page will show the tags. Show Post navigation: if enabled the post details page will show the next post, previous post links navigation. Show Author Info Box: Show / Hide Author info box. Show Comments: if enabled the post details page will show the post comments. Show Related Posts: if enabled the post details page will show related posts at the end of the post. Show Social Sharing options: if enabled the post details page will show the share buttons. Show Twitter: if enabled the post details page will show the Twitter button. Show Facebook: if enabled the post details page will show the facebook button. Show Google Plus: if enabled the post details page will show the Google Plus button. Show LinkedIn: if enabled the post details page will show the LinkedIn button. Show Pinterest: if enabled the post details page will show the Pinterest button. There are other 8 social sharing links. This setting is for the Author's details page that can be found in this link: http://YOUR-DOMAIN/author/USER-NAME/, You can show hide author information, posts by author, and the way to display the author's posts (Large image, Small image, Grid, Masonry and Timeline) and even add text or HTML to be shown before and after All authors' pages. Notice: the text or HTML content before and after author's content will be applied on all authors pages not only one author's page. Munza Comes with Unlimited SideBars Feature that enables you to add unlimited numbers of side bars in your wordpress site. to do this click on add sidebar, a new textbox will appear, then add your sidebar name and hit save changes button. Munza Comes with Unlimited SOCIAL ICONS Feature that enables you to add unlimited numbers of social icons in your wordpress site. to do this click on add Social Icon, a new icon select, textbox for title and link will appear, Also you can drag and drop social icons to re-order them as you wish, then hit save changes button. Note: To Enable this feature you must install Munza Core Plugin first. You will find a button to export all current theme options in an external file to be a backup in case you need to revert these settings back. You will find a button to import theme options from another file. Show Side Bar: In the shop pages select to show / hide the shop sidebar. Select Side Bar: Select the side bar for shop pages. Sidebar Position: select sidebar position ( Right sidebar or left sidebar or witout sidebar) . Products Columns: Number of products columns per row. Show Side Bar ? In the product page select to show / hide the shop sidebar. Related Products Per Page: How many related products will be shown in the single product page. Related Products Columns: Number of Related Products columns per row. Show Welcome message: Show / Hide welcome message on the top of the forum index page. Welcome Message: Type the text that appears in the welcome message on the top of the forum index page. Default Template: For default page templates. Home Page Template: For home pages. Slider Revolution Blank Template: For Slider Revolution Page Template. 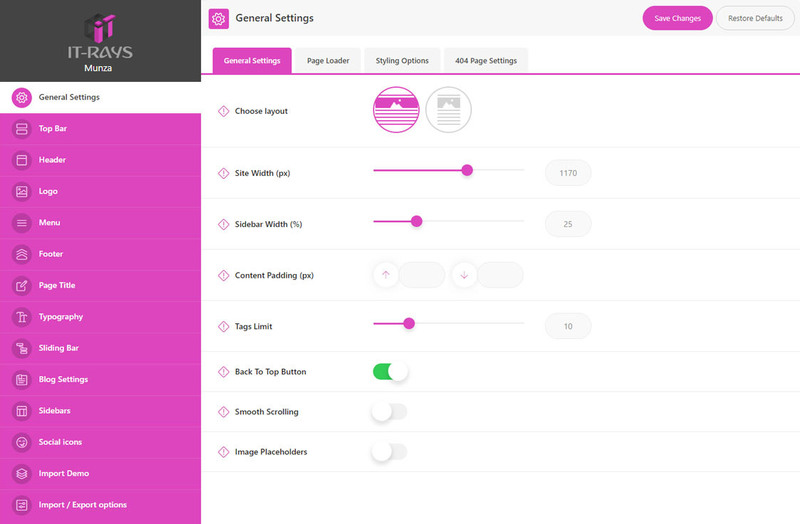 Inherit From Theme: This is to take the layout style from the main theme options settings. Full Width: This is for pages that has no sidebar, and takes the full content container width. Full Page: This is for pages that takes the full page width not centered content. Left Bar: Content with left sidebar pages. Right Bar: Content with left sidebar pages. As you see in the Select Menu, you can Choose a different menu for this page only. 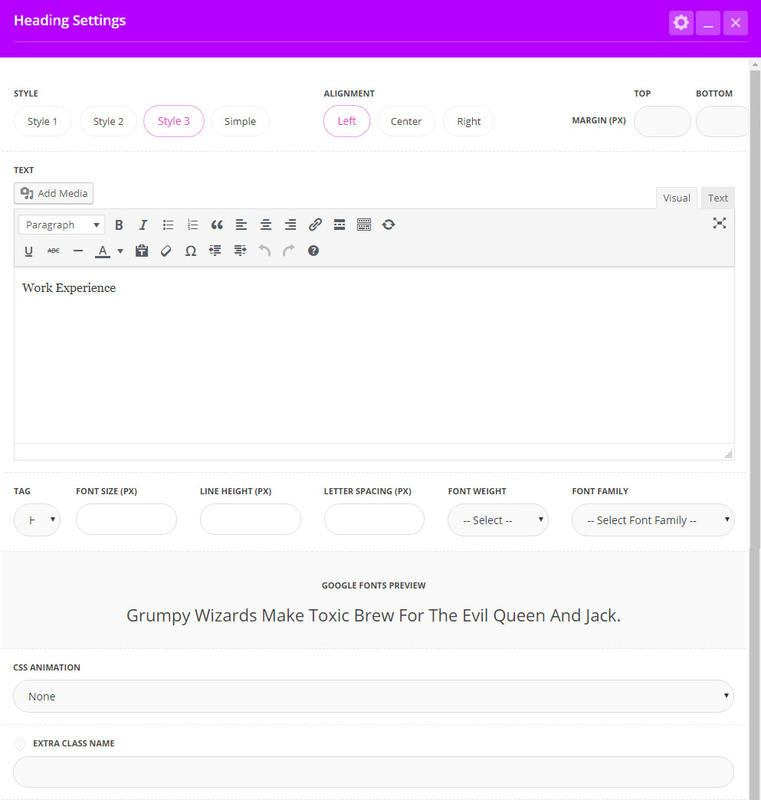 Notic: These options are applied individually on the page you are editing only, so this can give the page a custom options such as hiding header, footer, customizing the page title for this page only. As a result for that, you can build all your site pages and posts with different styles. Page Title you can hide page title, add custom background image, custom icon, set different page title style, set custom height, custon colors and also set custom video background, and too many other options. Footer Show / Hide Footer, set different footer style. select the one page menu and hit the button select as shown in the next image. After Adding the menu items click save menu. 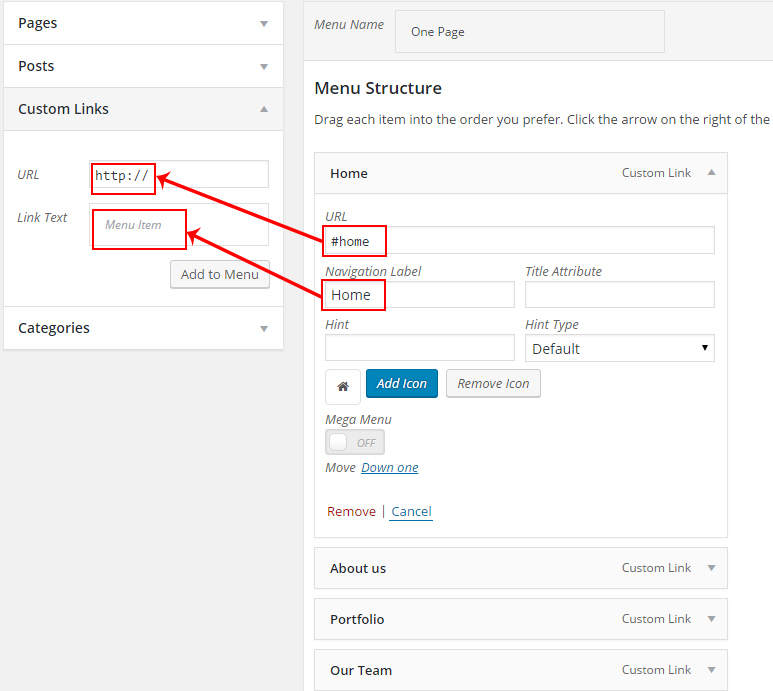 Important: All links you created in this menu we'll create a Rows in the page with number equals to these menu items number. From the Right tools go to page Attributes then open Template dropdown menu and select One-Page Template. Go to the page content then switch to BACKEND EDITOR. Add Element -> Select Row. 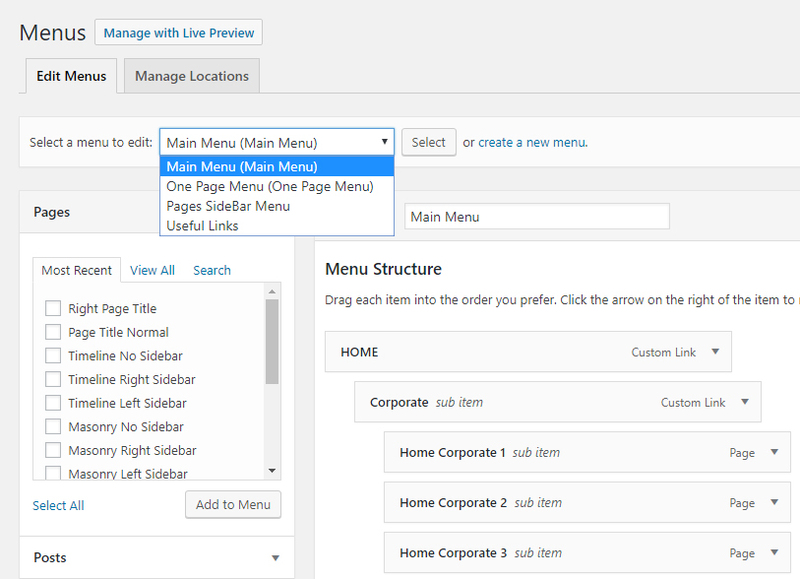 Edit Row and go to ID and enter the first menu item link without the # to be home only and change other Row Properties as you need. Repeat this step according to the other menu items you have created. Munza comes with 30 Main custom shortcodes + the default shortcodes from Visual composer. 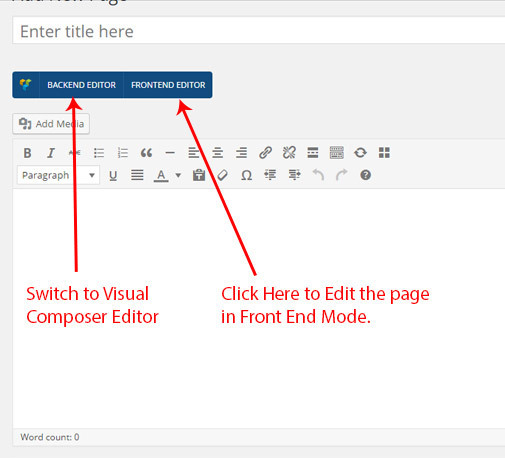 to see how to use the default visual composer shortcodes just go to visual composer documentation and follow the steps. When you click add new element, Click on Row then a new element will be now seen in the content area. Let's Explain the Row Properties in visual composer: As you see the following image , the numbers on each item describes what it do. Edit existing column in this row. Delete existing column in this row. Select the padding values Top and Bottom for this row. If Checked the row will take full width of the container. If Checked the row content will be stretched to full width not centered in the page container. if Checked the row columns will have the same height. If Checked the row will take the full page height. Add Extra class name to style this row individually. Row layer order (z-index) Ex: set this row z-index "2" and the below row "1", so this row will be above the below one. Add new css class to easily customize this row with css code. Assign ID to this Row, This will be required in ONE-PAGE Creation. Color -> Only Add background color for the row. Row Background Type : Image. Row Background repeat options (No repeat, Repeat vertically or horizontally). Choose if you need the background will be fixed or scroll with mousewheel. Choose the background size (Cover - Contain - 100%). Animate the background horizontally or vertically. Enable Row Background Image Parallax Effect. Create Layer over the background image. If Overlay is Yes, The background color of the overlay layer and transparency level, Value from 0 to 1. Skew the background with custom styles. Row Background Type : Video. Video Type: from youtue or upload a video. Create Layer over the video. The background color of the overlay layer. Choose Heading Style from 4 predefined styles. Heading Alignment (Left - Center - Right). Heading Margin Top and Bottom in pixels. Heading Font Size in pixels. Heading Line height in pixels. Heading letter spacing in pixels. Heading Font Family from Google Fonts. Add Extra class name to style this Heading individually. When you click add new Testimonials a new window with Testimonials Settings will appear to choose the style, carousel and other options, then save changes. Box Style: Select box style from available 4 box styles. Shape: Select box shape from available 3 box shapes. Box Align: Text align inside the icon box. Use Icon ? : If checked a new tab with icons select will be shown and this will Show an icon with your Icon box element. Background Color: Choose Box background color from colorpicker. Border Color: Choose Box Border color from colorpicker. Hover - BG Color: Choose Box Hover background color from colorpicker. Hover - Border Color: Choose Box Hover Border color from colorpicker. Title: Enter text for box title. Link: Enter link for box title. Title Tag: Select title tag. Color: Choose a color for box title from color picker. Border Bottom Color: Choose a color for box title bottom border from color picker. Hover - Color: Choose a color for box title when hover on the main box from color picker. Hover - Border Bottom Color: Choose a color for box title bottom border when hover on the main box from color picker. Sub Title: Enter text for box title. Title Tag: Select Sub title tag. Color: Choose a color for box Sub title from color picker. Border Bottom Color: Choose a color for box Sub title bottom border from color picker. Hover - Color: Choose a color for box Sub title when hover on the main box from color picker. Hover - Border Bottom Color: Choose a color for box Sub title bottom border when hover on the main box from color picker. Content: Enter text for box Content. Hover - Color: Choose a color for box Sub Content when hover on the main box from color picker. Icon Type: Select your icon type from 3 types. Icon Library: Select your icon from icon Library. Icon: Select your icon from icons chooser. Color: Choose a color for the icon from color picker. Background Color: Choose a Background color for the icon from color picker. Border Color: Choose a Border color for the icon from color picker. Border Width: Enter border width in PX. Hover - Color: Choose a color for the icon when hover on the main box from color picker. Hover - Background Color: Choose a Background color for the icon when hover on the main box from color picker. Hover - Border Color: Choose a Border color for the icon when hover on the main box from color picker. Hover Style: Choose hover style from 3 available styles or you can disable hover. Show Read More Link ? Show / Hide Read More Link in the icon box element. Read More Text Enter text for read more box content. Style: Select read more button style from available 3 styles. Alignment: Horizontally align the read more button inside the icon box. Color: Choose a color for read more font color. Background Color: Choose a Background color for read more link. Border Color: Choose a Border color for read more link. Hover - Color: Choose a color for read more font color when hover on the main box. Hover - Background Color: Choose a Background color for read more link when hover on the main box. Hover - Border Color: Choose a Border color for read more link when hover on the main box. 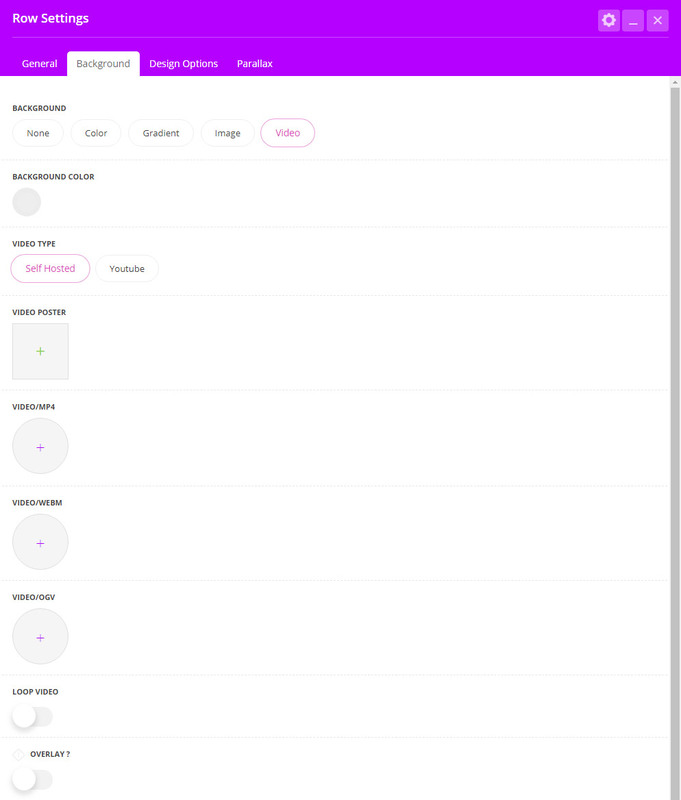 CSS Animation: Select animation type, delay and duration. Extra class name: Style particular content element differently - add a class name and refer to it in custom CSS. Sub Title: Enter feature sub title. Image: Upload or select an existing Feature image. Feature Style: Select the feature style from 3 predefined styles available. Image Shape: Select Feature image shape from 3 available shapes. Background Color: Choose a Background color for feature box. Title Color: Choose a solid color for title. Sub Title Color: Choose a solid color for feature sub title. Padding: Enter Padding Top, Right, Bottom and left values in PX. Margin: Enter Margin Top, Right, Bottom and left values in PX. Map Type: Select the map type from 4 available types. Zoom: Select the zoom value for google map. Height: Select the height of the map. Disable Mouse Wheel: If selected This will disable mouse scroll zoom in on the google map. API Key: Enter yor google map API Key. Address: Type here more details about the location on google map. Icon: Upload or type Image URL for the map marker on google map. Box Shape: Select box shape from available 3 box shapes. Alignment: Text align inside the Counter box. Background Color: Choose Counter Box background color from colorpicker. Border Width: Enter Counter Box Border widht in PX. Border Color: Choose Counter Box Border color from colorpicker. Border Style: Choose Counter Box Border style. Hover - BG Color: Choose Counter Box Hover background color from colorpicker. Hover - Border Color: Choose Counter Box Hover Border color from colorpicker. Title: Enter text for item title. Title Color: select title color from color chooser. Title Background Color: select title background color from color chooser. Font Size: Type title font size in px. Font Weight: Select title font weight. Hover - Color: Choose title color When Hover on Counter Box from color picker. Hover - Background Color: Choose title background color When Hover on Counter Box from color picker. Content: Enter item description text. Hover - Color: Choose content color When Hover on Counter Box from color picker. Theme: Select Counter Numbers Theme from 6 available themes. Start After: Enter the delay time that the numbers begin counting after it ( in milliseconds ). Text Before Number: Enter text that will be shown before the number. Text After Number: Enter text that will be shown after the number. Color: select numbers color from color chooser. Hover - Color: select numbers color When Hover on Counter Box from color chooser. Font Size: Type numbers font size in px. Font Weight: Select Numbers font weight. Icon Library: Select your icon from 6 icons Libraries. Icon Color: Select your icon color from color chooser. Hover - Color: Select icon hover color When Hover on Counter Box from color chooser. Font Size: Type icon size in px. Show Read More Link ? : Show / Hide Read more link. Divider Style: Select the divider style from 10 available styles. Color: Choose a solid color for the divider line. Use Icon ? If checked a new tab with icons select will be shown and this will Show an icon with your counter element. Title: Enter the title for this widget. Category: Select the posts category that will be shown. Blog Style: Select how the blog listing style would be : (Large Image, Small Image, Grid, Masonry and TimeLine). Max. Number of words: Enter the maximum number of words to be shown in the blog shortcode listing item. Image Size: Select the featured image size. Posts Per Page: Enter the posts per page to be shown in the blog shortcode listing. Pager Type: Select the pager type (Numeric, Older-Newer and Load More). Pager Style: Select the pager style from the 5 predefined styles. Pager Position: Select the pager position Horizontally. Style: Select how the Recent Posts style would be from available 5 styles. Carousel ? : Show the recent posts in carousel. Number Of Posts: Enter the posts per page to be shown in the Recent Posts listing. Max. Number of words: Enter the maximum number of words to be shown in the Recent Posts listing. Non Carousel Columns: Number of Coulmns in case not Carousel view.